Phonetic transcription that is included in quality dictionaries is great, but what use of the transcription if you do not know phonetic alphabet? We have selected for you five places with free interactive content, perfect for quick reference. The list is based on several evaluation points, including free use, interactivity, outlay and offline content. Our aim was to show phonemic charts as a reference only, and not to discuss lessons about IPA (International Phonetic Alphabet). This tool is provided to us by Macmillan Publishers and we have selected it as one of the best phonetic charts online. The outlay is very simple and straightforward. After clicking on a symbol, the phoneme is articulated, followed by a full word in which the phoneme occurs. Macmillan Phonetic Chart is available as offline content, in form of a simple program that comes in two flavors. The first version displays the phonemes in small window. The second, however, uses full screen, which is simply perfect for presentation (realia) in a class. One of the things we would like to see is written form of spoken example word. The software is free for use. The forerunner on our list is Phonemic Chart by British Council. This simple software uses clear outlay with nicely grouped and uncluttered vowels, consonants and diphthongs. 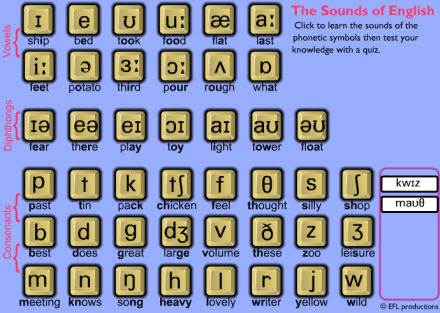 After clicking on a phonetic symbol, the sound of the phoneme is played. We think that written word in which the phoneme is used or word read after the phoneme (like in Macmilan’s Chart) would be more natural than isolated symbol. We place this tool on the second place because of its simplicity and the fact that download versions are available both for MS Windows and Mackintosh. The third place is reserved for BBC English. The most basic of all in the list, this tool is opened in a browser window and it is not available offline as a separate application. The chart itself is simple with clearly articulated phonemes. We have decided to select it because of quality content that is available on the same place if you decide to hang around – pages named Pronunciation tips. BBC is in the top of the game, with great lessons on English pronunciation. Each of the sounds is explained in a separate lesson, accompanied by video content. Another great site from BBC. On this site the phonemes are presented within the words, and isolated phonemes cannot be heard. It is great companion to previously mentioned charts, because it is possible to hear the phoneme in the context. However, the content is available online only. If you wish to use it on your computer offline, you will have to buy it. It would be good to mention that the software offers simple pronunciation quiz and phonetic diagram (both available online). The downside is somewhat strange voice recordings and not-so-friendly design for your eyes. This page is the least interactive of all listed here. When a user clicks on a word, the pronunciations are played as mp3 recording (whole words are read, and not the phonemes). We decided to include the site here because it offers American and British versions of the pronunciation. To more advanced students, extra explanations in plain English will be of use and great introduction to International Phonetic Alphabet (IPA). The content is available online only, unless you are ready to save each file individually. This closes our list for time being. Do you know of any great online phonetic charts? Feel free to share in the comments. Hello. In Merriam Webster dictionaries phonetic transcription is different from IPA (International Phonetic Alphabet). However, the publisher has given an overview of all characters used in the dictionary, together with IPA equivalents. Here is the page where you will find Merriam Webster Pronunciation Guide in PDF. the charts are, no doubts effective but, addition of ‘triphthongs’ would have made it even more informative. Very informative for novice/first-timer trainee-teacher in this area of linguistics, searching between alternatives. Thanks. It is a great site about phonetics. I liked it very much. i got summarized information about phonemes.my heartiest congratulations for your good effort. It’s nice.If you don’t mine can you provide the off-line dictionary? I think if you find the aforementioned charts useful, you will also find this one at Oxford University Press as useful if not more. I wish there were same resources for American English. This kids phonemic chart is really fun and interactive…I know my kids really like it! The Macmillan chart is available in British and American English via the mobile app . However, the interactive chart offered online is only for British English. I wish Macmillan would offer an American English chart online. reallu great information . . . The use of colour, which transfers through to word and spelling charts, makes everything much more useful. Next Next post: Are your language errors fossilized?